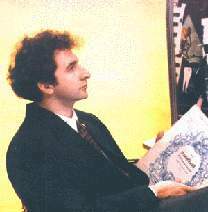 DEJAN SAVIC (1957), the outstanding Yugoslav conductor, is born in Belgrade in the family of musicians. He graduated conducting with distinction at the Academy of Music in Belgrade and received his Masters Degree at the Academy of Arts in Novi Sad. On a specialization cours, Mr. Savic was working with Berislav Klobucar. During the period of 3 years (1989-93) D. Savic was the Artistic Director and Chief conductor of the Nis Symphony Orchestra, where he made a large number of outstanding concert evenings, tours (Skopje, Beograd) and recordings with world known artists such as Ludmil Angelov, piano, Ksenija Jankovic, cello, Mihai Ungureanu, piano, Radmila Bakocevic, soprano, Jovan Kolundzija ,Sreten Krstic and Stefan Milenkovic, violin etc. Since 1993 he is the Principal Conductor of the Belgrade Opera and Ballet Company, where some of the most famous vocal artists performed with him, i.e. Elena Obrastzova, Makvala Kasrashvili, Jadranka Jovanovic, Fabio Armiliato a.o. His guest - appearances in Yugoslav opera houses include The Opera and Ballet of the Serbian National Theater in Novi Sad as well as the renewal of the operatic scene in Nis in 1996, after almost 30 years. Conducting all major Yugoslav symphony orchestras Mr Savic also toured Greece (State Symphony Orchestras of Athens and Thessalonika, the ERT Symphony Orchestra and Mixed Choir), Bulgaria (the Bulgarian National Symphony Orchestra, also concert within the Athens-Belgrade-Sofia concert serie and the Burgas Philharmonic Orchestra), Romania (Philharmonic orchestras and Choirs of Craiova and Iasi), Russia (the Tomsk State Symphony Orchestra), USA (the Bloomingdale Symphony Orchestra of New York), appearing with him the soloists such as Anatolij Krstev, cello, Kjell Baekkelund, piano, Eliso Virsaladze, piano, a.o. D. Savic was appointed Guest Conductor to the ERT Symphony Orchestra in Athens being the only Yugoslav conductor appearing in its largest concert hall "Megaron musicis". Mr. Savic is a present Artistic director of the famous "Pro Musica" chamber ensemble, the oldest one in Yugoslavia, with whom he also made a vaste number of recordings, tours and concert appearings. In 1994, the concert season of this ensemble brought to Beograd for the soloists such artists as Alirio Diaz, guitar, Stojka Milanova, violin, Vladimir Krainev, piano, and Christina Anghelescu, violin. In National D.G.O.S. Opera in Dublin, Ireland, in 1995 D. Savic conducted 5 performances of "Il Trovatore" by Verdi,unanimously estimated by the critics as the best performances in the last few years. D. Savic made recordings for Radio and TV in many countries as well as several CD’s for the PGP production of RTV Belgrade. For his artistic achievments he has received a number of recognitions and awards.